Topic says it all. Our last house was grandfathered so we didn’t have to deal with it. Both code and the bylaw say any door must be self closing and self latching, unless we fence the pool separately, which we don’t want to do. There doesn’t seem to be any reasonable after market device, and no new patio doors that meet the requirement either. Can you substitute an open door alarm. That's what county requires on every door to the pool if inside the fence. 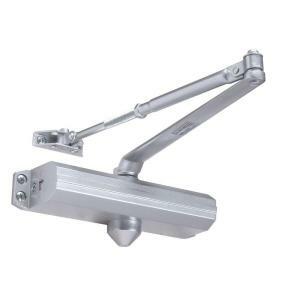 There are aftermarket closures/latches made for patio doors here in the southwest US. You can then never leave your door open again. And they are intrusive to install. The door alarms are acceptable to most municipalities. They also mean you will never leave your patio door open again. And as stated, a pain. But from a safety perspective, necessary. What is your location? It helps us understand the conditions that you maintain your pool in. Is it a standard 3 hinge door or a slider? I think all door knobs met the latch requirement. Is it a storm type door or reg type door ? If you have to have self-latching self-closing gates, are there other code requirements? Our requirements are self-closing, self-latching and anti-scale/climbproof. That usually means upright rails with no foot hold places. In addition, all entrances to the pool that are attached to the house must be alarmed. There are a bunch of self closing hinges available aftermarket. HD, online etc. You may find some that match your doors. Another suggestion would be to contact door manufacturer and see if they have a self closing hinge. Garage doors to home are also required to be self closing. Hinges are out there. Just need to search around. You may need more than one per door depending on weight and size of door. Good luck! Our community has the same rules BUT if you put an automatic cover on the pool, none of the doors or gates have to self-close. Even though it was expensive, we went with that option. Is that an option where you are?